For other uses, see Duel (disambiguation). A duel is an arranged engagement in combat between two people, with matched weapons, in accordance with agreed-upon rules. Duels in this form were chiefly practiced in early modern Europe with precedents in the medieval code of chivalry, and continued into the modern period (19th to early 20th centuries) especially among military officers. 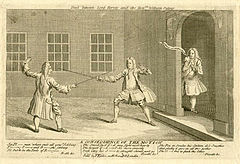 During the 17th and 18th centuries (and earlier), duels were mostly fought with swords (the rapier, and later the small sword), but beginning in the late 18th century in England, duels were more commonly fought using pistols. Fencing and pistol duels continued to co-exist throughout the 19th century. The duel was based on a code of honor. Duels were fought not so much to kill the opponent as to gain "satisfaction", that is, to restore one's honor by demonstrating a willingness to risk one's life for it, and as such the tradition of dueling was originally reserved for the male members of nobility; however, in the modern era it extended to those of the upper classes generally. On occasion, duels with pistols or swords were fought between women. Legislation against dueling goes back to the medieval period. The Fourth Council of the Lateran (1215) outlawed duels, and civil legislation in the Holy Roman Empire against dueling was passed in the wake of the Thirty Years' War. From the early 17th century, duels became illegal in the countries where they were practiced. Dueling largely fell out of favor in England by the mid-19th century and in Continental Europe by the turn of the 20th century. Dueling declined in the Eastern United States in the 19th century and by the time the American Civil War broke out, dueling had begun to wane even in the South. Public opinion, not legislation, caused the change. Depiction of a judicial combat in the Dresden codex of the Sachsenspiegel (early to mid-14th century), illustrating the provision that the two combatants must "share the sun", i.e. align themselves perpendicular to the Sun so that neither has an advantage. 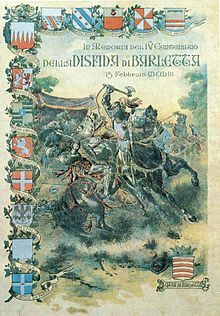 Commemorative poster for the fourth centennial of the Disfida di Barletta, the Challenge of Barletta, fought on 13 February 1503 between 13 Italian and 13 French knights all shown wearing full plate armour. In Western society, the formal concept of a duel developed out of the medieval judicial duel and older pre-Christian practices such as the Viking Age holmgang. In Medieval society, judicial duels were fought by knights and squires to end various disputes. Countries like Germany, United Kingdom, and Ireland practiced this tradition. Judicial combat took two forms in medieval society, the feat of arms and chivalric combat. The feat of arms was used to settle hostilities between two large parties and supervised by a judge. The battle was fought as a result of a slight or challenge to one party's honor which could not be resolved by a court. Weapons were standardized and typical of a knight's armoury, for example longswords, polearms etc., however, weapon quality and augmentations were at the discretion of the knight, for example, a spiked hand guard or an extra grip for half-swording. The parties involved would wear their own armour; for example, one knight wearing full plate might face another wearing chain mail. The duel lasted until one party could no longer fight back. In early cases, the defeated party was then executed. This type of duel soon evolved into the more chivalric pas d'armes, or "passage of arms", a chivalric hastilude that evolved in the late 14th century and remained popular through the 15th century. A knight or group of knights (tenans or "holders") would stake out a travelled spot, such as a bridge or city gate, and let it be known that any other knight who wished to pass (venans or "comers") must first fight, or be disgraced. If a traveling venans did not have weapons or horse to meet the challenge, one might be provided, and if the venans chose not to fight, he would leave his spurs behind as a sign of humiliation. If a lady passed unescorted, she would leave behind a glove or scarf, to be rescued and returned to her by a future knight who passed that way. The Roman Catholic Church was critical of dueling throughout medieval history, frowning both on the traditions of judicial combat and on the duel on points of honor among the nobility. Judicial duels were deprecated by the Lateran Council of 1215, but the judicial duel persisted in the Holy Roman Empire into the 15th century. The word duel comes from the Latin 'duellum', cognate with 'bellum', meaning 'war'. During the early Renaissance, dueling established the status of a respectable gentleman and was an accepted manner to resolve disputes. 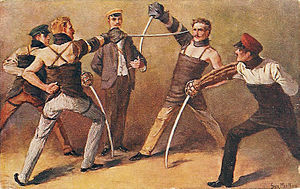 Dueling remained highly popular in European society, despite various attempts at banning the practice. The first published code duello, or "code of dueling", appeared in Renaissance Italy. The first formalized national code was France's, during the Renaissance. In 1777, a code of practice was drawn up for the regulation of duels, at the Summer assizes in the town of Clonmel, County Tipperary, Ireland. A copy of the code, known as 'The twenty-six commandments', was to be kept in a gentleman's pistol case for reference should a dispute arise regarding procedure. However, the tradition had become deeply rooted in European culture as a prerogative of the aristocracy, and these attempts largely failed. For example, King Louis XIII of France outlawed dueling in 1626, a law which remained in force for ever afterwards, and his successor Louis XIV intensified efforts to wipe out the duel. Despite these efforts, dueling continued unabated, and it is estimated that between 1685 and 1716, French officers fought 10,000 duels, leading to over 400 deaths. By the late 18th century, Enlightenment era values began to influence society with new self-conscious ideas about politeness, civil behaviour and new attitudes towards violence. The cultivated art of politeness demanded that there should be no outward displays of anger or violence, and the concept of honor became more personalized. By the 1770s the practice of dueling was increasingly coming under attack from many sections of enlightened society, as a violent relic of Europe's medieval past unsuited for modern life. As England began to industrialize and benefit from urban planning and more effective police forces, the culture of street violence in general began to slowly wane. The growing middle class maintained their reputation with recourse to either bringing charges of libel, or to the fast-growing print media of the early nineteenth century, where they could defend their honor and resolve conflicts through correspondence in newspapers. Influential new intellectual trends at the turn of the nineteenth century bolstered the anti-dueling campaign; the utilitarian philosophy of Jeremy Bentham stressed that praiseworthy actions were exclusively restricted to those that maximize human welfare and happiness, and the Evangelical notion of the "Christian conscience" began to actively promote social activism. Individuals in the Clapham Sect and similar societies, who had successfully campaigned for the abolition of slavery, condemned dueling as ungodly violence and as an egocentric culture of honor. Dueling became popular in the United States – the former United States Secretary of the Treasury Alexander Hamilton was killed in a duel against the sitting Vice President Aaron Burr in 1804. Between 1798 and the Civil War, the US Navy lost two-thirds as many officers to dueling as it did in combat at sea, including naval hero Stephen Decatur. Many of those killed or wounded were midshipmen or junior officers. Despite prominent deaths, dueling persisted because of contemporary ideals of chivalry, particularly in the South, and because of the threat of ridicule if a challenge was rejected. By about 1770, the duel underwent a number of important changes in England. Firstly, unlike their counterparts in many continental nations, English duelists enthusiastically adopted the pistol, and sword duels dwindled. Special sets of dueling pistols were crafted for the wealthiest of noblemen for this purpose. Also, the office of 'second' developed into 'seconds' or 'friends' being chosen by the aggrieved parties to conduct their honor dispute. These friends would attempt to resolve a dispute upon terms acceptable to both parties and, should this fail, they would arrange and oversee the mechanics of the encounter. In the United Kingdom, to kill in the course of a duel was formally judged as murder, but generally the courts were very lax in applying the law, as they were sympathetic to the culture of honor. This attitude lingered on – Queen Victoria even expressed a hope that Lord Cardigan, prosecuted for wounding another in a duel, "would get off easily". The Anglican Church was generally hostile to dueling, but non-conformist sects in particular began to actively campaign against it. By 1840, dueling had declined dramatically; when the 7th Earl of Cardigan was acquitted on a legal technicality for homicide in connection with a duel with one of his former officers, outrage was expressed in the media, with The Times alleging that there was deliberate, high level complicity to leave the loop-hole in the prosecution case and reporting the view that "in England there is one law for the rich and another for the poor" and The Examiner describing the verdict as "a defeat of justice". The last fatal duel between Englishmen in England occurred in 1845, when James Alexander Seton had an altercation with Henry Hawkey over the affections of his wife, leading to a duel at Southsea. However, the last fatal duel to occur in England was between two French political refugees, Frederic Cournet and Emmanuel Barthélemy near Englefield Green in 1852; the former was killed. In both cases, the winners of the duels, Hawkey and Barthélemy, were tried for murder. But Hawkey was acquitted and Barthélemy was convicted only of manslaughter; he served seven months in prison. However, in 1855, Barthélemy was hanged after shooting and killing his employer and another man. 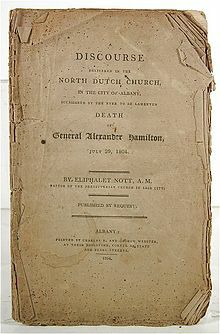 An anti-dueling sermon written by an acquaintance of Alexander Hamilton. Dueling also began to be criticized in America in the late 18th century; Benjamin Franklin denounced the practice as uselessly violent, and George Washington encouraged his officers to refuse challenges during the American Revolutionary War because he believed that the death by dueling of officers would have threatened the success of the war effort. However, the practice actually gained in popularity in the first half of the nineteenth century especially in the South and on the lawless Western Frontier. Dueling began an irreversible decline in the aftermath of the Civil War. Even in the South, public opinion increasingly came to regard the practice as little more than bloodshed. The most notorious American duel was the Burr–Hamilton duel, in which notable Federalist and former Secretary of the Treasury Alexander Hamilton was fatally wounded by his political rival, the sitting Vice President of the United States Aaron Burr. Another American politician, Andrew Jackson, later to serve as a General Officer in the U.S. Army and to become the seventh president, fought two duels, though some legends claim he fought many more. On May 30, 1806, he killed prominent duellist Charles Dickinson, suffering himself from a chest wound which caused him a lifetime of pain. Jackson also reportedly engaged in a bloodless duel with a lawyer and in 1803 came very near dueling with John Sevier. Jackson also engaged in a frontier brawl (not a duel) with Thomas Hart Benton in 1813. On September 22, 1842, future President Abraham Lincoln, at the time an Illinois state legislator, met to duel with state auditor James Shields, but their seconds intervened and persuaded them against it. On 30 May 1832, French mathematician Évariste Galois was mortally wounded in a duel at the age of twenty, the day after he had written his seminal mathematical results. Irish political leader Daniel O'Connell killed John D'Esterre in a duel in February 1815. O'Connel offered D'Esterre's widow a pension equal to the amount her husband had been earning at the time, but the Corporation of Dublin, of which D'Esterre was a member, rejected O'Connell's offer and voted the promised sum to D'Esterre's wife themselves. However, D'Esterre's wife consented to accept an allowance for her daughter, which O'Connell regularly paid for more than thirty years until his death. The memory of the duel haunted him for the remainder of his life. In 1808, two Frenchmen are said to have fought in balloons over Paris, each attempting to shoot and puncture the other's balloon. One duellist is said to have been shot down and killed with his second. In 1843, two other Frenchmen are said to have fought a duel by means of throwing billiard balls at each other. 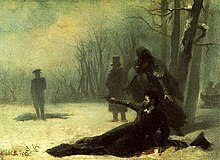 The works of Russian poet Alexander Pushkin contained a number of duels, notably Onegin's duel with Lensky in Eugene Onegin. These turned out to be prophetic, as Pushkin himself was mortally wounded in a controversial duel with Georges d'Anthès, a French officer rumoured to be his wife's lover. D'Anthès, who was accused of cheating in this duel, married Pushkin's sister-in-law and went on to become a French minister and senator. In 1864, American writer Mark Twain, then a contributor to the New York Sunday Mercury, narrowly avoided fighting a duel with a rival newspaper editor, apparently through the intervention of his second, who exaggerated Twain's prowess with a pistol. In the 1860s, Otto von Bismarck was reported to have challenged Rudolf Virchow to a duel. Virchow, being entitled to choose the weapons, chose two pork sausages, one infected with the roundworm Trichinella; the two would each choose and eat a sausage. Bismarck reportedly declined. The story could be apocryphal, however. Duels had mostly ceased to be fought to the death by the late 19th century. The last known fatal duel in Ontario was in Perth, in 1833, when Robert Lyon challenged John Wilson to a pistol duel after a quarrel over remarks made about a local school teacher, whom Wilson married after Lyon was killed in the duel. Victoria, BC was known to have been the centre of at least two duels near the time of the gold rush. One involved a British arrival by the name of George Sloane, and an American, John Liverpool, both arriving via San Francisco in 1858. Duel by pistols, Sloane was fatally injured and Liverpool shortly returned to the US. The fight originally started on board the ship over a young woman, Miss Bradford, and then carried on later in Victoria's tent city. Another duel, involving a Mr. Muir, took place around 1861, but was moved to an American island near Victoria. 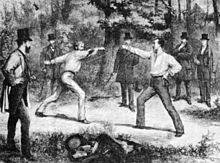 The last fatal duel in England took place on Priest Hill, between Englefield Green and Old Windsor, on 19 October 1852, between two French political exiles, Frederic Cournet and Emmanuel Barthélemy, the former being killed. By the outbreak of World War I, dueling had not only been made illegal almost everywhere in the Western world, but was also widely seen as an anachronism. Military establishments in most countries frowned on dueling because officers were the main contestants. Officers were often trained at military academies at government's expense; when officers killed or disabled one another it imposed an unnecessary financial and leadership strain on a military organization, making dueling unpopular with high-ranking officers. With the end of the duel, the dress sword also lost its position as an indispensable part of a gentleman's wardrobe, a development described as an "archaeological terminus" by Ewart Oakeshott, concluding the long period during which the sword had been a visible attribute of the free man, beginning as early as three millennia ago with the Bronze Age sword. Charles I outlawed dueling in Austria-Hungary in 1917. Germany (the various states of the Holy Roman Empire) has a history of laws against dueling going back to the late medieval period, with a large amount of legislation (Duellmandate) dating from the period after the Thirty Years' War. Prussia outlawed dueling in 1851, and the law was inherited by the Reichsstrafgesetzbuch of the German Empire after 1871. Pope Leo XIII in the encyclica Pastoralis officii (1891) asked the bishops of Germany and Austria-Hungary to impose penalties on duellists. In Nazi Germany, legislations on dueling were tightened in 1937. After World War II, German authorities persecuted academic fencing as duels until 1951, when a Göttingen court established the legal distinction between academic fencing and dueling. In 1839, after the death of a congressman, dueling was outlawed in Washington, D.C. A constitutional amendment was proposed. From 1921 until 1971, Uruguay was one of the few places where duels were fully legal. During that period, a duel was legal in cases where "...an honor tribunal of three respectable citizens, one chosen by each side and the third chosen by the other two, had ruled that sufficient cause for a duel existed." In the late 19th and early 20th century, pistol dueling became popular as a sport in France. The duelists were armed with conventional pistols, but the cartridges had wax bullets and were without any powder charge; the bullet was propelled only by the explosion of the cartridge's primer. Participants wore heavy, protective clothing and a metal helmet with a glass eye-screen. The pistols were fitted with a shield that protected the firing hand. Pistol dueling was an associate (non-medal) event at the 1908 Summer Olympics in London. Dueling culture survived in France, Italy and Latin America well into the 20th century. After World War II, duels had become rare even in France, and those that still occurred were covered in the press as eccentricities. Duels in France in this period, while still taken seriously as a matter of honor, were not fought to the death. They consisted of fencing with the épée mostly in a fixed distance with the aim of drawing blood from the opponent's arm. In 1949, former Vichy-official Jean-Louis Tixier-Vignancour fought school teacher Roger Nordmann. The last known duel in France took place in 1967, when Gaston Defferre insulted René Ribière [fr] at the French Parliament and was subsequently challenged to a duel fought with swords. René Ribière lost the duel, having been wounded twice. In Uruguay, a pistol duel was fought in 1971 between Danilo Sena and Enrique Erro, in which neither of the combatants was injured. The traditional situation that led to a duel often happened after a perceived offense, whether real or imagined, when one party would demand satisfaction from the offender. One could signal this demand with an inescapably insulting gesture, such as throwing his glove before him. Usually challenges were delivered in writing by one or more close friends who acted as "seconds". The challenge, written in formal language, laid out the real or imagined grievances and a demand for satisfaction. The challenged party then had the choice of accepting or refusing the challenge. Grounds for refusing the challenge could include that it was frivolous, or that the challenger was not generally recognized as a "gentleman" since dueling was limited to persons of equal social station. However care had to be taken before declining a challenge, as it could result in accusations of cowardice or be perceived as an insult to the challenger's seconds if it was implied that they were acting on behalf of someone of low social standing. Participation in a duel could be honorably refused on account of a major difference in age between the parties and, to a lesser extent, in cases of social inferiority on the part of the challenger. Such inferiority had to be immediately obvious, however. As author Bertram Wyatt-Brown states, "with social distinctions often difficult to measure," most men could not escape on such grounds without the appearance of cowardice. Once a challenge was accepted, if not done already, both parties (known as "principals") would appoint trusted representatives to act as their seconds with no further direct communication between the principals being allowed until the dispute was settled. The seconds had a number of responsibilities of which the first was to do all in their power to avert bloodshed provided their principal's honor was not compromised. This could involve back and forth correspondence about a mutually agreeable lesser course of action, such as a formal apology for the alleged offense. In the event that the seconds failed to persuade their principals to avoid a fight they then attempted to agree on terms for the duel that would limit the chance of a fatal outcome, consistent with the generally accepted guidelines for affairs of honor. The exact rules or etiquette for dueling varied by time and locale but were usually referred to as the code duello. In most cases the challenged party had the choice of weapons with swords being favored in many parts of continental Europe and pistols in the United States and Great Britain. It was the job of the seconds to make all of the arrangements in advance, including how long the fight would last and what conditions would end the duel. Often sword duels were only fought until blood was drawn, thus severely limiting the likelihood of death or grave injury since a scratch could be considered as satisfying honor. In pistol duels the number of shots to be permitted and the range were set out. Care was taken by the seconds to ensure the ground chosen gave no unfair advantage to either party. A doctor or surgeon was usually arranged to be on hand. Other details often arranged by the seconds could go into minute details that might seem odd in the modern world, such as the dress code (duels were often formal affairs), the number and names of any other witnesses to be present and whether or not refreshments would be served. "Field of honor" redirects here. For other uses, see Field of Honor. The chief criteria for choosing the field of honor were isolation, to avoid discovery and interruption by the authorities; and jurisdictional ambiguity, to avoid legal consequences. Islands in rivers dividing two jurisdictions were popular dueling sites; the cliffs below Weehawken on the Hudson River where the Hamilton-Burr duel occurred were a popular field of honor for New York duellists because of the uncertainty whether New York or New Jersey jurisdiction applied. Duels traditionally took place at dawn, when the poor light would make the participants less likely to be seen, and to force an interval for reconsideration or sobering-up. For some time before the mid-18th century, swordsmen dueling at dawn often carried lanterns to see each other. This happened so regularly that fencing manuals integrated lanterns into their lessons. An example of this is using the lantern to parry blows and blind the opponent. The manuals sometimes show the combatants carrying the lantern in the left hand wrapped behind the back, which is still one of the traditional positions for the off hand in modern fencing. To first blood, in which case the duel would be ended as soon as one man was wounded, even if the wound was minor. Until one man was so severely wounded as to be physically unable to continue the duel. To the death (or "à l'outrance"), in which case there would be no satisfaction until one party was mortally wounded. In the case of pistol duels, each party would fire one shot. If neither man was hit and if the challenger stated that he was satisfied, the duel would be declared over. If the challenger was not satisfied, a pistol duel could continue until one man was wounded or killed, but to have more than three exchanges of fire was considered barbaric and, on the rare occasion that no hits were achieved, somewhat ridiculous. Under the latter conditions, one or both parties could intentionally miss in order to fulfill the conditions of the duel, without loss of either life or honor. However, doing so, known as deloping, could imply that your opponent was not worth shooting. This practice occurred despite being expressly banned by the Code Duello of 1777. Rule XII stated: "No dumb shooting or firing in the air is admissible in any case... children's play must be dishonourable on one side or the other, and is accordingly prohibited." Practices varied, however, but unless the challenger was of a higher social standing, such as a baron or prince challenging a knight, the person being challenged was allowed to decide the time and weapons used in the duel. The offended party could stop the duel at any time if he deemed his honor satisfied. In some duels, the seconds would take the place of the primary dueller if the primary was not able to finish the duel. This was usually done in duels with swords, where one's expertise was sometimes limited. The second would also act as a witness. For a pistol duel, the two would typically start at a pre-agreed length of ground, which would be measured out by the seconds and marked, often with swords stuck in the ground (referred to as "points"). At a given signal, often the dropping of a handkerchief, the principals could advance and fire at will. This latter system reduced the possibility of cheating, as neither principal had to trust the other not to turn too soon. Another system involved alternate shots being taken, beginning with the challenged firing first. Many historical duels were prevented by the difficulty of arranging the "methodus pugnandi". In the instance of Richard Brocklesby, the number of paces could not be agreed upon; and in the affair between Mark Akenside and Ballow, one had determined never to fight in the morning, and the other that he would never fight in the afternoon. John Wilkes, "who did not stand upon ceremony in these little affairs," when asked by Lord Talbot how many times they were to fire, replied, "just as often as your Lordship pleases; I have brought a bag of bullets and a flask of gunpowder." The duel arrived at the end of the sixteenth century with the influx of Italian honor and courtesy literature – most notably Baldassare Castiglione's Libro del Cortegiano (Book of the Courtier), published in 1528, and Girolamo Muzio's Il Duello, published in 1550. These stressed the need to protect one's reputation and social mask and prescribed the circumstances under which an insulted party should issue a challenge. The word duel was introduced in the 1590s, modelled after Medieval Latin duellum (an archaic Latin form of bellum "war", but associated by popular etymology with duo "two", hence "one-on-one combat"). Soon domestic literature was being produced such as Simon Robson's The Courte of Ciuill Courtesie, published in 1577. Dueling was further propagated by the arrival of Italian fencing masters such as Rocco Bonetti and Vincento Saviolo. By the reign of James I dueling was well entrenched within a militarised peerage – one of the most important duels being that between Edward Bruce, 2nd Lord Kinloss and Edward Sackville (later the 4th Earl of Dorset) in 1613, during which Bruce was killed. James I encouraged Francis Bacon as Solicitor-General to prosecute would-be duellists in the Court of Star Chamber, leading to about two hundred prosecutions between 1603 and 1625. He also issued an edict against dueling in 1614 and is believed to have supported production of an anti-dueling tract by the Earl of Northampton. Dueling however, continued to spread out from the court, notably into the army. In the mid-seventeenth century it was for a time checked by the activities of the Parliamentarians whose Articles of War specified the death penalty for would-be duellists. Nevertheless, dueling survived and increased markedly with the Restoration. Among the difficulties of anti-dueling campaigners was that although monarchs uniformly proclaimed their general hostility to dueling, they were nevertheless very reluctant to see their own favourites punished. In 1712 both the Duke of Hamilton and Charles 4th Baron Mohun were killed in a celebrated duel induced by political rivalry and squabbles over an inheritance. Rule 1.—The first offence requires the apology, although the retort may have been more offensive than the insult. —Example: A. tells B. he is impertinent, &C.; B. retorts, that he lies; yet A. must make the first apology, because he gave the first offence, and then, (after one fire,) B. may explain away the retort by subsequent apology . The 19th-century statesman Daniel O'Connell took part in a duel in 1815. Following the death of his opponent, John D'Esterre, O'Connell repented and from that time wore a white glove on his right hand when attending Mass as a public symbol of his regret. Despite numerous challenges, he refused ever to fight another duel. In 1862, in an article entitled Dead (and gone) Shots, Charles Dickens recalled the rules and myths of Irish dueling in his periodical All the Year Round. Four Prime Ministers of the United Kingdom have engaged in duels, although only two of them – Pitt and Wellington – held the office at the time of their duels. In Early Modern High German, the duel was known as Kampf, or Kampffechten. The German dueling tradition originates in the Late Middle Ages, within the German school of fencing. In the 15th century, duels were fought between members of the nobility wearing full plate armour. During the late 16th and the 17th century, this tradition was gradually replaced with the modern fencing with the rapier following the Dardi school, while at the same time the practice of dueling spread to the bourgeois classes, especially among students. The term Kampf is replaced by the modern German Duell during the same period, attested in the Latin form duellum from ca. 1600, and as Duell from the 1640s. A modern remnant of German dueling culture is found in the non-lethal Mensur tradition in Academic fencing. In the Ionian Islands in the 19th century, there was a practice of formalised fighting between men over points of honor. Knives were the weapons used in such fights. They would begin with an exchange of sexually related insults in a public place such as a tavern, and the men would fight with the intention of slashing the other's face, rather than killing. As soon as blood was drawn onlookers would intervene to separate the men. The winner would often spit on his opponent and dip his neckerchief in the blood of the loser, or wipe the blood off his knife with it. The winner would generally make no attempt to avoid arrest and would receive a light penalty, such as a short jail sentence and/or a small fine. In Poland duels have been known since the Middle Ages. The method of dueling in early medieval Poland was described in detail in the "Book of Elbing" containing the oldest record of the Polish common law (13th–14th century). Later, Polish dueling codes were formed based on Italian, French and German codes. The best known Polish code was written as late as 1919 by Wladyslaw Boziewicz. At this time duels were already forbidden in Poland, but the "Polish Honorary Code" was quite widely in use. Punishments for participation in duels were rather mild – up to a year's imprisonment if the outcome of the duel was death or grievous bodily harm. The tradition of dueling and the word duel itself were brought to Russia in the 17th century by adventurers in Russian service. Dueling quickly became so popular – and the number of casualties among the commanding ranks so high – that, in 1715, Emperor Peter the First was forced to forbid the practice on pain of having both duellists hanged. Despite this official ban, dueling became a significant military tradition in the Russian Empire with a detailed unwritten dueling code – which was eventually written down by V. Durasov and released in print in 1908. This code forbade duels between people of different ranks. For instance, an infantry captain could not challenge a major but could easily pick on a Titular Counsellor. On the other hand, a higher ranked person could not stoop to challenge lower ranks; so, it was up to his subordinates or servants to take revenge on their master's behalf. Dueling was also common among prominent Russian writers, poets, and politicians. Russian poet Alexander Pushkin fought 29 duels, challenging many prominent figures before being killed in a duel with Georges d'Anthès in 1837. His successor Mikhail Lermontov was killed four years later by fellow Army officer Nikolai Martynov. The dueling tradition died out in the Russian Empire slowly from the mid-19th century. Duels were common in much of South America during the 20th century, although generally illegal. In Argentina, during the 18th and 19th century, it was common for gauchos—cowboys—to resolve their disputes in a fight using working knives called facones. After the turn of the 19th century, when repeating handguns became more widely available, use of the facón as a close-combat weapon declined. Among the gauchos, many continued to wear the knife, though mostly as a tool. However, it was occasionally still used to settle arguments "of honor". In these situations two adversaries would attack with slashing attacks to the face, stopping when one could no longer see clearly through the blood. In Peru there were several high-profile duels by politicians in the early part of the 20th century including one in 1957 involving Fernando Belaúnde Terry, who went on to become President. In 2002 Peruvian independent congressman Eittel Ramos challenged Vice President David Waisman to a duel with pistols, saying the vice president had insulted him. Waisman declined. Uruguay decriminalized dueling in 1920, and in that year José Batlle y Ordóñez, a former President of Uruguay, killed Washington Beltran, editor of the newspaper El País, in a formal duel fought with pistols. In 1990 another editor was challenged to a duel by an assistant police chief. Although not forbidden by the government, the duel did not take place. Dueling was once again prohibited in 1992. A senator, and future President of Chile, Salvador Allende, was challenged to a duel by his colleague Raúl Rettig (who later headed a commission investigating human rights violations committed during the 1973–1990 military rule in Chile) in 1952. Both men agreed to fire one shot at each other, and both fired into the air. At that time, dueling was already illegal in Chile. There is a frequently quoted claim that dueling is legal in Paraguay if both parties are blood donors. No evidence exists that this is indeed true, and the notion has been outright denied by members of Paraguayan government. Wild Bill Hickok's duel with Davis Tutt became the quintessential quick draw duel in American history. European styles of dueling established themselves in the colonies of European states in America. Duels were to challenge someone over a woman or to defend one's honor. In the US, dueling was used to deal with political differences and disputes and was the subject of an unsuccessful amendment to the United States Constitution in 1838. It was fairly common for politicians at that time in the United States to end disputes through duels, such as the Burr–Hamilton duel and the Jackson-Dickinson duel. Dueling has become outdated in the north since the early-19th century. 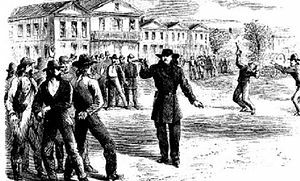 Dueling in the US was not uncommon in the south and west, even after 1859, when 18 states outlawed it, but it became a thing of the past in the United States by the start of the 20th century. To this day, anyone sworn into any statewide or county office or judgeship in Kentucky must declare under oath that he or she has not participated in, acted as a second or otherwise assisted in a duel. Teenage duels were not uncommon, at least in South Carolina and New Orleans... Three ironies emerged from the dueling custom. First, though confined to a segment of the upper classes, dueling served essentially the same purpose as the lowest eye-gouging battle among Tennessee hog drivers. Second, because of this congruence between upper and lower concepts of honor, dueling was not at all undemocratic. It enabled lesser men to enter, however imperfectly, the ranks of leaders, and allowed followers to manipulate leaders to their taste. Third, the promise of esteem and status that beckoned men to the field of honor did not always match the expectation, but often enough dueling served as a form of scapegoating for unresolved personal problems. Physician J. Marion Sims has left us a chapter describing the duelling culture in 1830s South Carolina. Crude duels were also fought to uphold personal honor in the rural American frontier, that were partly influenced by the code duello brought by Southern emigrants. The quick draw duel is a mythological aspect of a gunfighter story in most Western stories, although real life Wild West duels did occur such as the Wild Bill Hickok – Davis Tutt shootout and Luke Short – Jim Courtright duel. Gunfighters Jim Levy and Tom Carberry became infamous for participating in at least two quick draw duels in their lifetimes. Besides quick draw duels, more formal European duels were also fought in the Old West such as those participated by former cowboys Hugh Anderson and Burton C. Mossman. Settlements such as Tombstone and Dodge City, prevented these duels by prohibiting civilians from carrying firearms by local ordinance. Duels or niyuddha were held in ancient India (including modern-day Pakistan and Bangladesh) for various reasons. Many kshatriya considered it shameful to die in bed, and in their old age often arranged for a yuddha-dhan, literally meaning "combat charity". According to this practice when a warrior felt he did not have much time to live, he would go along with a few attendants and ask another king for a duel or a small scale battle. In this way he chooses his own time and manner of death and is assured that he will die fighting. Duels to the death were legal in some periods, and punishable by execution in others. Ancient epics and texts like the Dharmashastra tell that duels took place under strict rules of conduct, and to violate them was both shameful and sinful. According to these rules, it was forbidden to injure or kill an opponent who has lost their weapon, who surrenders, or who has been knocked unconscious. 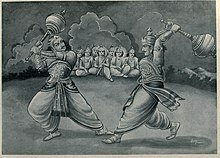 The Manusmṛti tells that if a warrior's topknot comes loose during a duel, the opponent must give him time to bind his hair before continuing. Both duellists are required to wield the same weapon, and specific rules may have existed for each weapon. For example, the Mahabharata records that hitting below the waist is forbidden in mace duels. In one ancient form of dueling, two warriors wielded a knife in the right hand while their left hands were tied together. The Portuguese traveller Duarte Barbosa tells that dueling was a common practice among the nobles of the Vijayanagara Empire, and it was the only legal manner in which "murder" could be committed. After fixing a day for the duel and getting permission from the king or minister, the duellists would arrive at the appointed field "with great pleasure". Duellists would wear no armour and were bare from the waist up. From the waist down they wore cotton cloth tightly round with many folds. The weapons used for dueling were swords, shields and daggers which the king would appoint them of equal length. Judges decided what rewards would be given to duellists; the winner may even acquire the loser's estate. Duels in Manipur were first recorded in the Chainarol-Puya which details the ethics of dueling. When a fighter was challenged, the day for the bout would be fixed to allow for time to prepare the weapons. Allowing the opponent the first chance to fire an arrow or hurl a spear was considered particularly courageous. The duel itself was not necessarily to the death, and usually ended once first blood has been drawn. However, the victor was still expected to behead the loser. Either before the duel or before the beheading, the fighters would share the meals and wine prepared by their wives. If it had been so requested beforehand, the loser's body may be cremated. Heads were taken as trophies, as was custom among the headhunters of northeast India. Various taboos existed such as not killing an opponent who runs, begs or cries out of fear, or anyone who pleads for protection. In Kerala, duels known as ankam were fought by the kalari-trained Chekavar caste on behalf of their local rulers. Weapons and rules for dueling in the Indonesian archipelago vary from one culture to another. In Madura, dueling is known as carok and was typically practiced with the sickle or celurit. The Madurese people imbued their sickles with a khodam, a type of mythical spirit, by a way of prayer before engaging in a duel. The traditional form of dueling among the Bugis-Makassar community was called sitobo lalang lipa in which the duellists fight in a sarong. The challenger stands with a loosened sarong around him and respectfully invites the other man to step into the sarong. The sarong itself is kept taut around both their waists. When both men are inside, an agreement to fight til death and thereafter shall be no hereditary grudge nor will any party be allowed to question the duel, shall be made. If both fighters agree, they then engage each other within the confined space of a single sarong. Unlike the more typical kris duel of Javanese and Malay culture, the Bugis-Makassar community instead wield badik, the local single-edge knife. Because avoiding injury is near-impossible even for the victor, this type of duel was considered a sign of extraordinary bravery, masculinity and the warrior mentality. Although true sitobo lalang lipa are no longer practiced, enactments of these duels are still performed at cultural shows today. In Edo period Japan, there was a tradition of dueling (決闘?, kettō) among the samurai class. On April 14, 1612 the famous Japanese swordsman Miyamoto Musashi dueled his rival Sasaki Kojiro on the island of Funajima. Musashi is said to have fought over 60 duels and was never defeated. Dueling was a common practice in the Philippines since ancient times, and continued to be recorded during Spanish and American colonialism. In the Visayas, there is a tradition of dueling where the offended party would first hagit or challenge the offender. The offender would have the choice whether to accept or decline the challenge. In the past, choice of weapons was not limited. But most often, bolos, rattan canes, and knives were the preferred weapons. Duels were either first-blood, submission, or to the last man standing. Duels to death were known as huego-todo (without bounds). The older generation of Filipino martial artists still tell of duels which occurred during their youth. Duels with the bolo knife were prominent in North and Central Philippines, common in farmlands where the machete-like bolo is commonly used as a domestic tool. A duel reported internationally occurred on 14 April 1920 by Prescott Journal Miner which was known as "The First Bolo Duel in Manila since the American Occupation". It happened when Ángel Umali and Tranquilino Paglinawan met with friends in a vacant lot near the city centre before dusk to settle a feud; Paglinawan lost his left hand. With no law against bolo fights, Umali was charged for a petty crime. Bolo fights are still seen today, albeit rarely, and have become part of Filipino rural culture. On 7 January 2012, two middle-aged farmers were wounded after a bolo duel over the harvest of rice in a village in Zamboanga City. Geronimo Álvarez and Jesús Guerrero were drinking and at the height of their arguing Álvarez allegedly pulled out his bolo and hacked Guerrero. Guerrero also pulled his bolo and repeatedly hacked Álvarez, and their relatives immediately intervened and rushed them to hospital. Dueling has provided themes for numerous works of popular culture. In Scaramouche (1952), the climactic duel is reputed to be the longest in cinema at over six minutes. Dollars Trilogy (1964-1966) with pistols using quick draw. Popularized the Mexican stand-off style of duel - the most famous being The Good, the Bad and the Ugly (1966), in which Blondie challenges Tuco and Angel Eyes to a three-way pistol duel. Black Panther (2018), two scenes featuring ritual combat for the royal title of "The Black Panther", ruler of Wakanda. Swords and spears. Alexandre Dumas penned a famous and comical treatment of dueling etiquette and practice in his novel The Three Musketeers. The protagonist d'Artagnan, in his youthful exuberance, accidentally insults three men on the same morning and schedules the duels that afternoon, one after the other. The initial conflicts are resolved, and the four men become companions-in-arms. Duels are described in many other Russian books, such as War and Peace by Leo Tolstoy, The Brothers Karamazov by Fyodor Dostoyevsky, and Fathers and Sons by Ivan Turgenev. William Makepeace Thackeray includes duels in the plots of Vanity Fair, The Luck of Barry Lyndon, The History of Henry Esmond, and A Shabby Genteel Story. In the latter, a duel between two men is rendered farcical when the pistols are shown to be unloaded. Hamilton (2015), Lin-Manuel Miranda’s musical inspired by Ron Chernow’s biography of the American founding father Alexander Hamilton, has three duels in it. The first is between John Laurens and Charles Lee with Alexander Hamilton and Aaron Burr as seconds (respectively). This is the first duel we see in the play, and it introduces the rules of dueling at the time, the code duello, in the song "Ten Duel Commandments". The second duel in the musical is between Philip Hamilton (Alexander Hamilton’s oldest son) and George Eacker, and takes place in the song "Blow Us All Away". The final duel in the play depicts the Burr-Hamilton duel. This duel is played out in detail in the song "The World Was Wide Enough". In the 1953 Popeye cartoon titled Ancient Fistory, an anachronistic pistol duel comically occurs in a medieval setting. In cartoons, a duel appeared in Chuck Jones's Mississippi Hare, when a riverboat gambler challenges Bugs Bunny to a pistol duel. In the Star Trek episode "The Squire of Gothos", Captain Kirk challenges the alien entity Trelane to a pistol duel. Trelane accepts but then delopes, frivolously granting Kirk a free shot. Kirk uses his shot to destroy Trelane's power source. In the 1985 miniseries "North and South", Cousin Charles Main is challenged to a duel by neighbor Preston Smith. Smith misses his shot and Main shoots into the air, sparing Smith's life. Later in the series, Ashton Main conspired with Forbes Lamotte to use a duel to kill her sister's husband Billy Hazard, but they fail. In "E-I-E-I-(Annoyed Grunt)," a 1999 episode of The Simpsons, Homer slaps many people with a glove and challenges them to duels to get what he wants until a real Southern gentleman accepts Homer's request for a duel. Turn: Washington's Spies (2014), an American period drama based on Alexander Rose's book Washington's Spies: The Story of America's First Spy Ring has a duel occur in episode 7, Mercy Moment Murder Measure. Abraham Woodhull is challenged to a pistol duel at dawn by John Graves Simcoe over the honor of Anna Strong. However, there is no historical evidence that either of these historical figures dueled one another. ^ a b Franz Liszt, Lehrbuch des Deutschen Strafrechts, 13th ed., Berlin (1903), § 93. 4. Der Zweikampf Archived 2013-01-01 at the Wayback Machine (pp. 327–333). ^ a b David Levinson and Karen Christensen. Encyclopedia of World Sport: From Ancient Times to the Present. Oxford University Press; 1st edition (July 22, 1999). pp. 206. ISBN 978-0195131956. ^ Hubbard, Ben. Gladiators: From Spartacus to Spitfires. Canary Press (August 15, 2011). Chapter: Pas D'armes. ASIN: B005HJTS8O. ^ In 1459 (MS Thott 290 2) Hans Talhoffer reported that in spite of Church disapproval, there were nevertheless seven capital crimes that were still commonly accepted as resolvable by means of a judicial duel. ^ a b Hamilton, Joseph (1829). The only approved guide through all the stages of a quarrel ((Internet Archive) ed.). Dublin: Millikin. Retrieved 29 June 2009. ^ "The Death of Dueling" (PDF). Archived from the original (PDF) on 2014-01-07. Retrieved 2014-01-07. ^ David W. Bebbington, "The Evangelical Conscience," Welsh Journal of Religious History (2007) 2#1, pp 27–44. ^ "The American Experience | The Duel | Dueling, American Style". Pbs.org. Archived from the original on 2012-11-11. Retrieved 2012-10-22. ^ Drake, Ross (March 2004). "Duel! Defenders of honor or shoot-on-sight vigilantes? Even in 19th-century America, it was hard to tell". Smithsonian Magazine. Retrieved 2012-10-22. ^ a b c d "The common is steeped in history, at Keep Englefield Green - The Heritage". Keepenglefieldgreen.org. Archived from the original on 2011-07-26. Retrieved 2010-05-30. ^ Banks, S. "Very little law in the case: Contests of Honour and the Subversion of the English Criminal Courts, 1780-1845"
^ The Trial of James Thomas Earl of Cardigan before the Right Honourable the House of Peers, etc. London: Published by order of the House of Peers. 1841. ^ Staff (21 February 1841). "Defeat of Justice". The Examiner (1725). London: Albany Fonblanque. ^ "TRIAL OF LIEUTENANT HAWKEY FOR THE WILFUL MURDER OF LIEUTENANT SETON IN A DUEL". Hampshire Telegraph and Sussex Chronicle (2441). Portsmouth, England. July 18, 1846. ^ a b "1855: Emmanuel Barthelemy, duelist". Executed Today. Retrieved 25 October 2014. ^ Carnegie, Dale (1982). How to Win Friends & Influence People. New York, NY: POCKET BOOKS. p. 9. ISBN 978-0-671-72365-1. ^ Baldick, Robert (1965). The Duel: A History of Duelling. Chapman & Hall. Retrieved 19 April 2011. ^ a b "Smithsonian Magazine". Smithsonianmag.com. Retrieved 2010-05-30. ^ "Mark Twain, A Biography by Albert Bigelow Paine: Part I A Comstock Duel". Classicauthors.net. Archived from the original on 2010-06-11. Retrieved 2010-05-30. ^ "Chapters from my Autobiography by Mark Twain: Chapter VIII". Twain.classicauthors.net. Archived from the original on 2010-07-04. Retrieved 2010-05-30. ^ Schultz, M. (2012-05-24). "Rudolf Virchow". Emerging Infectious Diseases. 14 (9): 1480–1481. doi:10.3201/eid1409.086672. PMC 2603088. ^ Strozier, Charles B.; Flynn, Michael (1996-01-01). Genocide, War, and Human Survival. Rowman & Littlefield. p. 195. ISBN 9780847682270. Retrieved 27 February 2014. ^ The Old Cemeteries Society (Pioneer Square) pgs 7-9. ^ R. E. Oakeshott, European weapons and armour: From the Renaissance to the industrial revolution (1980), p. 255. ^ Hitler's decree[clarification needed] was a reaction to a duel between two Nazi party members, Roland Strunk was killed in a duel with Horst Krutschinna. ^ 18 December 1951, confirmed by the Federal Court of Justice on 29 January 1953 (BGHSt 4, 24). ^ "A Century of Lawmaking for a New Nation: U.S. Congressional Documents and Debates, 1774 - 1875". memory.loc.gov. Retrieved 2016-07-29. ^ "A Duel with Rifles". Library of Congress. July 17, 2013. ^ H.R. 8, Proposing an Amendment to the U.S. Constitution to Prohibit any Person who was Involved in a Duel from Holding Public Federal Office. File Unit: Bills and Resolutions Originating in the House during the 25th Congress, 1837 - 1839. National Archives and Records Administration. 1838. ^ David S. Parker (Summer 2001). "Law, Honor, and Impunity in Spanish America: The Debate over Dueling, 1870-1920". Law and History Review. 19 (2): 311–341. JSTOR 744132. ^ "Duel With Wax Bullets" (PDF). The New York Times. February 26, 1909. Retrieved 24 December 2014. ^ "Dueling with Wax Bullets". Popular Mechanics. Vol. 10. October 1908. p. 765. ^ The Sketch: A Journal of Art and Actuality (No. 808 Vol LXIII, Sixpence ed.). Ingram brothers. 1908-07-22. p. 41. ^ "A French lawyer and a schoolteacher fought a duel today in a meadow near Paris. Roger Nordmann the schoolteacher was reportedly pricked by the lawyer Jean-Louis Tixier- Vignancour's sword and the duel ended with everyone's honor intact. The feud started three weeks go when. Tixier-Vignancbur challenged Nordmann to a duel with pistols after he said Nordmann insulted him during a treason trial; Nordmann accepted the challenge but said he had never fired anything more potent than . a water pistol. He then chose two of his prettiest girl students, as seconds. The 'lawyer objected on the grounds that a second must be ready to take his principal's place and he could not lift his hand against a woman. The weapons and the seconds Were properly arranged after weeks of negotiations. The duelists went into hiding from newspapermen and police, since dueling is illegal. Only their seconds knew the time and place of combat." Lubbock Avalanche-Journal i, 13 November 1949, p. 55. ^ "People: Apr. 28, 1967". Time. 1967-04-28. Retrieved 2010-05-30. ^ LOS ÚLTIMOS DUELOS LaRed21, 28 November 2011. ^ "The Mystic Spring (1904) by D.W. Higgins". Gaslight.mtroyal.ab.ca. Archived from the original on 2010-12-16. Retrieved 2010-05-30. ^ Presumably based on romantic depictions of the age of chivalry. [clarification needed] The custom of "flinging the gauntlet in the face of another Knight" is illustrated in early Italian romances such as Orlando Furioso (The Scots Magazine 89/90 (1822), p. 575), and the English phrase of "throwing down the gauntlet" occurs in the context of Tudor-era tournaments from the 1540s. ^ Lynn, p. 255, 257. ^ "How to Defend a Monopoly". Classicalfencing.com. 2006-03-26. Retrieved 2012-10-22. ^ a b c "Eccentric medical men". Medico-Chirurgical Review. XXXI. 1 April – 30 September 1839. Retrieved 19 April 2011. ^ This usage apparently goes back to John of Legnano, author of a 14th-century work on dueling, De Bello, cited by du Cange Pugna corporalis deliberata hinc inde duorum, ad purgationem, gloriam, vel odii aggregationem. 3. Duellum, Glossarium ad scriptores mediae et infimae latinitatis (1678), ed. augm., Niort : L. Favre, 1883‑1887, t. 3, col. 203b. ^ Baldick, Robert (1965). The Duel: A History of Duelling. Chapman & Hall. ISBN 9780600328377. Retrieved 19 April 2011. ^ Wilson Lyde, John (2004) . "Appendix". The Code of Honor, Or, Rules for the Government of Principals and Seconds in Duelling. reprinted by Kessinger Publishing. ISBN 978-1-4191-5704-2. ^ Gwynn, Denis (1947). Daniel O'Connell. Cork University Press. p. 126. ^ Dickens, Charles; Chapman and Hall (May 10, 1862). "All the year round". Dickens & Evans (Firm): 212–216. ^ Etymologisches Wörterbuch der deutschen Sprache : Kluge, Friedrich, 1856-1926 : Free Download & Streaming : Internet Archive. Strassburg, Trübner. 2001-03-10. Retrieved 2012-10-22. ^ Thomas W. Gallant (2000-09-20). "| Honor, Masculinity, and Ritual Knife Fighting in Nineteenth-Century Greece | The American Historical Review, 105.2". The History Cooperative. Archived from the original on 2012-06-29. Retrieved 2010-05-30. ^ Marek Adamiec. "Polski kodeks honorowy". Monika.univ.gda.pl. Retrieved 2010-05-30. ^ "Pushkin duels. Full list" (in Russian). D-push.net. Retrieved 2012-10-22. ^ a b David S. Parker (Summer 2001). "Law, Honor, and Impunity in Spanish America: The Debate over Dueling, 1870-1920". Law and History Review. 19 (2): 311–341. JSTOR 744132. ^ "Americas | 'Insulted' politician wants a pistol duel". BBC News. 2002-09-26. Retrieved 2010-05-30. ^ Miller, Jeffrey (2003-04-25). Where There's Life, There's Lawsuits ... ISBN 978-1-55022-501-3. Retrieved 2010-05-30. ^ Nick Caistor (5 May 2000). "Raúl Rettig (obituary)". The Guardian. ^ Jesse (February 18, 2010). "paraguayan-smackdown". Mississippi library commission. ^ Morgan, William (1838). "H.R. 8, Proposing an Amendment to the U.S. Constitution to Prohibit any Person who was Involved in a Duel from Holding Public Federal Office". National Archives of the United States of America. Retrieved July 28, 2016. ^ "Politics And Pistols: Dueling In America". History Detectives. PBS. Retrieved 2012-07-22. ^ "Kentucky Duels Over Oath Of Office". NPR. 12 March 2010. Retrieved 3 January 2015. ^ Wyatt-Brown, Bertram. 1982. Southern honor: ethics and behavior in the old South. New York: Oxford University Press. Pages 167 and 350-351. ^ Sims, J. Marion (1885). The Story of My Life. D. Appleton & Company. pp. 88–99. Retrieved October 20, 2018. ^ "Wild Bill Hickok fights first western showdown". History.com. July 21, 2014. Retrieved October 4, 2014. ^ McGrath, Roger D. Gunfighters, Highwaymen & Vigilantes: Violence on the Frontier. University of California Press (March 23, 1987). pp. 99- 100. ISBN 978-0520060265. ^ Robert R. Dykstra (1983). The Cattle Towns. University of Nebraska Press. pp. 116–35. ISBN 978-0-8032-6561-5. ^ a b Jeanine Auboyer (1965). Daily Life in Ancient India. France: Phoenix Press. p. 58. ^ Kaushik Roy. Hinduism and the Ethics of Warfare in South Asia: From Antiquity to the Present. Cambridge University. ^ M.L. Dames (1918). Travels of Duerte Barbosa. London. ^ Communal Road to a Secular Kerala.Page 30. George Mathew. Concept Pub.Co, 1989. 1989. ISBN 978-81-7022-282-8. Retrieved 2007-12-28. ^ Religion and Social Conflict in South Asia.Page 27. Bardwell L. Smith. BRILL publications ,1976. 1976. ISBN 978-90-04-04510-1. Retrieved 2007-12-28. ^ A. Latief Wiyata (2002). Carok: Konflik Kekerasan Dan Harga Diri Orang Madura. PT LKiS Pelangi Aksara. ISBN 9789799492678. ^ "Tomanurung Perang Sejati Orang Bugis" (PDF). Media Indonesia. Retrieved 18 May 2014. ^ "Philippine Martial Arts Institute - Traditional Filipino Weapons". Marcialtirada.net. Retrieved 2012-10-22. ^ "Bolos Weapons in Filipino Duel: One Hand Cut Off". Retrieved 2012-10-22. ^ "Argument over rice harvest leads to bolo duel in Zamboanga City". Sun.Star. 2012-01-07. Retrieved 2012-10-22. Baldick, Robert. The Duel: A History of Duelling. London: Chapman & Hall, 1965. Banks, Stephen. Duels and Duelling, Oxford: Shire, 2012. Banks, Stephen. "Very little law in the case: Contests of Honour and the Subversion of the English Criminal Courts, 1780-1845" (2008) 19(3) King's Law Journal 575–594. Banks, Stephen. "Dangerous Friends: The Second and the Later English Duel" (2009) 32 (1) Journal of Eighteenth Century Studies 87–106. Banks, Stephen. "Killing with Courtesy: The English Duelist, 1785-1845," (2008) 47 Journal of British Studies 528–558. Bell, Richard, "The Double Guilt of Dueling: The Stain of Suicide in Anti-dueling Rhetoric in the Early Republic," Journal of the Early Republic, 29 (Fall 2009), 383–410. Freeman, Joanne B. "Dueling as Politics: Reinterpreting the Burr-Hamilton Duel." The William and Mary Quarterly, 3d series, 53 (April 1996): 289–318. Frevert, Ute. "Men of Honour: A Social and Cultural History of the Duel." trans. Anthony Williams Cambridge: Polity Press, 1995. Greenberg, Kenneth S. "The Nose, the Lie, and the Duel in the Antebellum South." American Historical Review 95 (February 1990): 57–73. Hopton, Richard (1 January 2011). Pistols at Dawn: A History of Duelling. Little, Brown Book Group Limited. ISBN 978-0-7499-2996-1. Morgan, Cecilia (1995). "'In Search of the Phantom Misnamed Honour': Duelling in Upper Canada". Canadian Historical Review. 76 (4): 529–562. doi:10.3138/chr-076-04-01. Rorabaugh, W. J. "The Political Duel in the Early Republic: Burr v. Hamilton." Journal of the Early Republic 15 (Spring 1995): 1–23. Schwartz, Warren F., Keith Baxter and David Ryan. "The Duel: Can these Gentlemen be Acting Efficiently?." The Journal of Legal Studies 13 (June 1984): 321–355. Duels and Duelling (Stephen Banks) 2012. The Field of Honor Benjamin C. Truman. (1884); reissued as Duelling in America (1993). Ritualized Violence Russian Style: The Duel in Russian Culture and Literature, Irina Reyfman (1999). Marek Żukow-Karczewski (1987), Pojedynki w dawnej Polsce (Duels in the old Poland), Przekrój, 2204, 17. 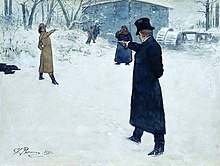 Wikimedia Commons has media related to Duels. Allen, Douglas, W., and Reed, Clyde, G., 2006, "The Duel of Honor: Screening for Unobservable Social Capital," American Law and Economics Review: 1–35. Kingston, Christopher G., and Wright, Robert E. "The Deadliest of Games: The Institution of Dueling" Dept. of Econ., Amherst College, Stern School of Business, NY Univ. "Dueling" . New International Encyclopedia. 1905. "Duel" . Encyclopædia Britannica (11th ed.). 1911. Herbermann, Charles, ed. (1913). "Duel" . Catholic Encyclopedia. New York: Robert Appleton Company. "Duel and Dueling" . Encyclopedia Americana. 1920.